A disturbing environmental trend, desertification is occurring globally. 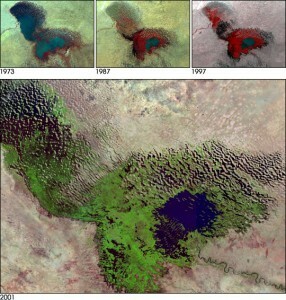 However one striking example of this phenomenon is the disappearance of Lake Chad. It is located between the borders of Cameroon, Chad, Niger, and Nigeria feeding large numbers of people, animals and plant life in the region. Lake Chad was one of the largest fresh bodies of water on the African continent and its disappearance will have a tremendous impact on the population surrounding it. The problem of Lake Chad is increasingly complex because of the international nature of the desertification. Lake Chad is a regional problem East African and North African member states of the AU and UN must deal with. A collaborative approach to combating the desertification of Lake Chad is needed to reverse the current trends. Desertification is a process of drying which turns previously wet areas into areas classically defined as desert. The Sahara is moving southward drying the Chad Basin. Communities once dependent on the Lake are now finding it difficult to cope. Food insecurity and water insecurity are among many problems accompanying the desertification. The international identification of desertification as a primary environmental concern 20 years ago has shed a closer look at the status of Lake Chad. “Desertification, along with climate change and the loss of biodiversity, were identified as the greatest challenges to sustainable development during the 1992 Rio Earth Summit.” Twenty years later at the 2012 Rio Earth Summit, again a topic for conversation was geared towards sustainable development. There was specific talk with Lake Chad Basin Commission, however, the question remains whether rhetoric will relate to reality on the ground. Since 1992, the situation has only become increasingly dire. An article by Coe and Foley indicates that “according to the Global Resource Information Database of the United Nations Environment Programme, [Lake Chad] shrank as much as 95% from about 1963 to 1998.” The disappearance of Lake Chad will impact millions of people all of whom depend on the lake as their main source for drinking water, irrigation, and food. The region’s growing population dependent on the Lake combined with the reduction of water and resources has resulted in the exponential drying of Lake Chad. There is debate about what is causing such rapid dying. Is it the larger problem of desertification and climate change, or over fishing and destructive local irrigation techniques? It is clear through research that both are to blame, and whatever the cause this environmental crisis must be dealt with in a multifaceted approach. The combination of decreasing rainfall, poor water management and according to UNEP (United Nations Environmental Programme), accounts for the rapid desertification of Lake Chad. “Over the last 40 years, the discharge from the Chari/Logone river system at the city of N’Djamena in Chad has decreased by almost 75 percent…”(NASA, 2001) This decrease has lead to longer dry seasons, and the inability to feed local populations. The frequent famines surrounding the Lake Chad region will sadly only increase if nothing is done to reverse the desertification. There is a lot at stake in saving Lake Chad. The “Lake Chad basin is home to over 20 million people with the majority dependent on the lake and other wetlands for their fishing, hunting, farming and grazing. 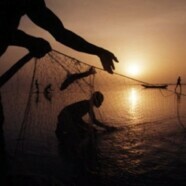 But the basin is recognized as highly challenged by climate change, desertification and unsustainable management of water resources and fisheries, according to WWF [World Wildlife Foundation].” Those who were once dependent on fishing now have to make the transition to farming. “Certainly where there is a decent water supply, [such as in Dugarri] the land can be highly productive. Near the village [BBC] saw maize, rice, okra, sweet potatoes and cassava.” Historic traditions of regional ethnic groups are being disturbed. The World Bank highlights that in pilot projects surrounding lake Chad the “Recognition and support to traditional organizations of hunters, fishermen, women, pastoralists and foresters,” will be essential for success. Representations from each of these groups in larger projects will aid in understanding the cultural intricacies of this disaster and what is necessary for each specific group. Environmental issues and poverty are inextricability linked in the context of Africa; combating these issues in an isolationist fashion would go against the interconnected realities of environmental and human livelihood. Boundaries limit success in the Chad Basin are caused and exacerbated by ethnic tensions. International donors are needed to fund many programs. Projects centered on Lake Chad’s desertification reversal highlights an important aspect of the climate change issue. The treatment of symptoms will not solve the larger problem of global climate change. It will take the efforts of people thousands of miles away in a combined effort to combat the global climate change. The improvement of the global condition will make it easier to accomplish the difficult task of desertification reversal. “In 2010 WWF, which partnered with the LCBC [Lake Chad Basin Commission], the Ramsar Convention and the Global Environment Facility on projects in Lake Chad and with the governments on achieving the declaration, said: ‘the challenge now is to turn the promise of protection for Lake Chad into a reality for the millions that depend on it.’” Commitment internationality has also been echoed by regional voices in “October 2010, [former] Nigerian President Goodluck Jonathan stressed the collective determination of leaders of the LCBC member countries to salvage the lake.” However it remains to be seen whether or not proposed projects by the UN, LCBC, the World Bank will result in relief that millions of people need. Despite the doom and gloom there is evidence to suggest that, “The soils in the basin are young.” And due to the wind patterns and average depth of Lake Chad there are, “high level of lake bio-mass.” Salvation of current levels and perhaps reversal of desertification may be possible from proposed river rerouting, conservation techniques, technology sharing, and dispersal of aid to prevent conflict. The situation of Lake Chad highlights how environmental crisis can result in political, economic and social disparity. This is truly a dire situation and eventually there will be no lake left to save. “The UN Food and Agriculture Organization (FAO) has called the situation an “ecological catastrophe,” predicting that the lake could disappear this century.” This issue needs more attention and funding to aid those struggling in the Lake Chad region. Birkett, M.-T. S. (2000). 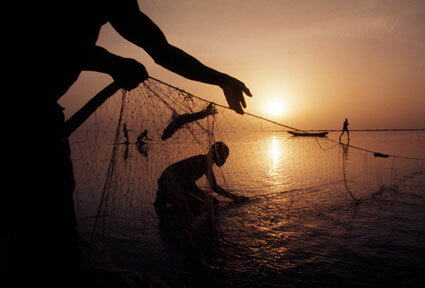 Fishing and Farming at Lake Chad: Responses to Lake-Level Fluctuations. Geographic Journal , 166 (2), 156-172. Coe M.T., Foley. J. (2001). “Human and natural impacts on the water resources of the Lake Chad basin. Journal of Geophysical Research , 106 (D4), 3349-3356. World Bank. (2002). Process Framework for the Mitigation of Social Impacts of the Lake Chad Basin Commission (LCBC) Project . The World Bank Africa Safeguards Policy Enhancement Team , Africa Safeguards Policy Enhancement Team . Birkett, M.-T. S. (2000). Fishing and Farming at Lake Chad: Responses to Lake-Level Fluctuations. Geographic Journal , 166 (2), 160. World Bank. (2002). Process Framework for the Mitigation of Social Impacts of the Lake Chad Basin Commission (LCBC) Project . The World Bank Africa Safeguards Policy Enhancement Team , Africa Safeguards Policy Enhancement Team, 18. Birkett, M.-T. S. (2000). Fishing and Farming at Lake Chad: Responses to Lake-Level Fluctuations. Geographic Journal , 166 (2), 158.